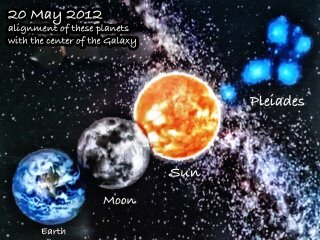 What's Happening In Our Solar System On May 20th? (The panasonic window on the above page seems the best so far) ENJOY! whoop whoop ! happy dance is here!!!!!!! Yeeeee Ha! As above ~ So below ! This is fantastic, tuuli. Thank you! and subsequent Tolec/Andromeda Council response: "a. What appears to be a connective 'umbilical cord' is functionally the same thing. It is a conduit that is connected from one of our Andromeda Council biospheres to your sun. The reason that the color of our biosphere is black and dark is because an ultraviolet radioactive protective shield is in place to protect the biosphere while the work is being done. This biosphere is one of the Andromeda Council's ships. The technology being used originated on the planet Terial in the Mirach star system. a couple of years old, but the sequence of events he proposes (or is relaying) is partly being supported elsewhere by people like Ben Fulford and David Wilcock (prosperity, mass arrests, change over of government leadership, disclosure). The part I didn't understand was the part about the "Migration" to Inner Earth. Why would we be migrating? Well, if the sun is going to expand, as Pane Andov says, thereby frying Outer Earth*, we would need to be protected. During this time of rebirth on Outer Earth and the evolution of our sun from a yellow star to a blue white star, as stated by the Andromeda Council via Tolec, we would be protected by the Agarthan population within the Earth and have the opportunity to heal and continue to evolve. *The image of the phoenix comes to mind: from the ashes is born a new world. It's fantastically poetic, I think. Like you, Kelly, I'm just trying to figure out the truth in between taking care of my two kids. And until something a bit more tangible manifests, these are all wonderfully interesting stories. By the by, that cosmic event that Tolec mentioned, in his interview about the destruction of the last undersea base (http://youtu.be/WKVR-fF8Rbs), if you listen closely to the point, about 30 minutes in, where he is talking about the nuclear fusion generators, he states (33:30) that he was told that if these generators had "gone off" or been exploded/bombed or whatever, that it would cause a "complete collapse of the whole Eastern Seaboard." So maybe the Eastern Seaboard (presumably he's referencing the US Eastern Seaboard) was just an example to elucidate how destructive the generators were, or maybe not. Maybe that's the area of the world where the last base was. I checked a map of fault lines + tectonic lines and the Eastern Seaboard of the US comes up pretty barren. Also, given the general proximity to DC (aka, Illuminati central, after London and Rome), I wouldn't be surprised if it's there. I find it interesting that you post this now. I had a few hours talk in a Facebook group last night about this very thing .... and Tolec. I brought the suns umbilical cord to Tolecs attention ... and his response was as you have stated above. If he had told us this would happen BEFORE hand, we would have gotten our proof. However, I can confirm proof for you .... when it happens. I have been told exactly where this "earthquake" will take place - a volcano actually, that will rise from the ocean (as they do) but a quake will result from it and will be felt around the entire planet. Very interesting timing, though. Cool! And I'm sooooo excited/anxious for things to get moving in a public way. 'felt around the world'? that's... big. O_O And yes, that timeframe seems appropriate between the annular eclipse/alignment (+Pleiadian/Alcyon alignment) and the Transit of Venus. With all of the research that I have been doing and the info that you have here as well, I feel that the sun will become a stargate with this alignment, the eclipse, and the quadrapoles occurring. Thank you for posting this info. I am excited and curious to see what develops from this point on. That looks amazing, Kelly, I wonder how we could 'link in' to be able to witness this, is there a site that will do this? (I haven't yet had time to look at all your video links)...sorry....I, too am excited about this.